Jettas have been around much longer than this, and I got to reacquaint myself with the reasons why. Aside from the lovely shade of Silk Blue, I can’t find much to distinguish today’s Jetta from most other vehicles on the road. Long gone is the unapologetically boxy look of my ’92 1.8-litre Jetta, replaced by a roofline that swoops up from the hood and down to the trunk lid, very rounded corners, a fin antenna on the roof and so forth. Darkened tail lights, body-coloured bumpers and door handles complete the reserved look. Before I stepped into the vehicle, I had to shut the door to confirm VW has kept that solid “thud” sound. It’s still there. It isn’t as loud as I recall, but it’s still reassuring. While setting the mirrors before my first drive, I noticed that the sideview mirror adjustment control also functions as a mirror defrost switch. That was one of many thoughtful, easy-to-interpret touches in the car that made it easy to get used to. Titan Black Cloth on firm seats was the first clue that VW aims my tester at the budget car-buying crowd. In fact, this trim level doesn’t offer many of the higher-end touches automakers regularly tout. (VW makes many of them available on higher trim levels.) Seat adjustments are manual. The height-adjustable and telescopic steering column is also manual. There’s no key fob/start button system. The fob does lock and unlock doors from a distance, but you need to flip the key out from the fob jackknife-style and insert it into the familiar steering column slot to start the car. There are no temperature numbers for climate controls. All of this is worth pointing out for the sake of comparison, but none of it bothered me. There’s something to be said for vehicles in which gadgetry is minimized in favour of simpler tried-and-true systems. For how small it was, I used to joke that you could play squash in the trunk of my old ’92 Jetta. Some things, thankfully, don’t change. It’s more accurate to say that this is a two-hockey-bag trunk. 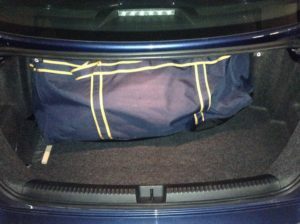 I had to fold one of the 60-40 split folding rear seats to fit my sticks through the trunk, but slightly shorter sticks would have fit diagonally. The 5” colour touchscreen proved adequate. Volkswagen designed a clean, simple, well-thought-out system enhanced by attractive graphics for transitions between certain screens. It’s a place where VW could have managed more features. For instance, the clock was five minutes fast when I picked up the Jetta, so I wanted to adjust it. Oddly, I had to use buttons inconveniently placed on the instrument cluster behind the steering wheel to set the time. Why VW didn’t put clock adjustments in the touchscreen, I don’t know. While I admired this Jetta for much of what it leaves out (and the resulting affordability of the car), I was disappointed to find only one USB port in the car. Maybe your experience is different than mine, but when two or more people enter a car, two of them frequently seize the opportunity to charge their phones. App-Connect smartphone integration enables drivers to connect their phones using Android Auto, Apple Carplay or Mirrorlink. This is the system drivers want when they use apps on their phones in the car, though the base system did a fine job finding music and podcasts on my iPod Touch. Time spent on the highway was quiet and relaxed. The 1.4T engine can produce 150 hp and 184 lbs-ft of torque. (VW also offers 1.8L, 2.0L 6-speed variants, along with a 1.4L 7-speed model.) The whole package provided ride quality you’d expect in a sedan costing tens of thousands of dollars more. 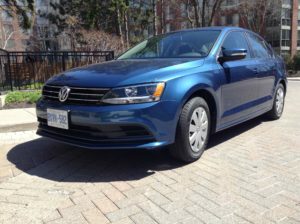 Transferred through the six-speed automatic transmission, the Jetta’s trip fuel economy numbers sometimes dropped to the 6.0 L/100km range, dipping even lower on slightly longer trips when cruise control managed my speed. I applied the 1.4T’s power confidently on city streets as well. This engine seems perfectly sized for the task, large enough to provide all the power drivers typically need while being economical enough to not drain their wallets of gas money in the process. A few times I really stepped on it. That’s when I experienced a lag in response that made me recall other turbo-enhanced vehicles I’ve driven. This Jetta won’t win many drag races, but driven at everyday road-going speeds it’s perfectly civilized. The Jetta takes regular 87 fuel in its 55-litre tank. The Trendline’s MSRP of $20,195 includes an attractive bundle of standard equipment, from air conditioning to heated front seats to a sophisticated touchscreen-based infotainment system. My tester, with a $400.00 connectivity package, comes to $20,595 (freight, PDI and excise tax on air conditioning all extra). I fondly recall the manual shifter and “decisive” steering feel on my old ’92 Jetta, but I’ve been told by more than one auto industry executive that I’m a member of a dying breed. A VW rep told me Canadians go for this configuration of vehicle – a quiet, automatic, easy-turning, modestly handsome, well-priced car. I can understand that. It may seem like Volkswagen made concessions by not including more technology on the 2016 Jetta 1.4T. During my time with the Jetta, I was reminded that not everybody gets impressed by a flood of gizmos in in a car’s cabin. Even initial gadget-awe can wear off during the grind of daily commutes and errands. If all a driver wants is a comfortable yet economical drive that fits a modest budget, the Jetta Trendline is worth a look.